CALL US FOR *ANY* PRINCESS or CUNARD CRUISE! *** Cruise Sale - March 1 - April 30! Reduced cruise fares! AUGUST 11 - 19 - PEAK WHALE SEASON! *** Cruise deposits are 10% of the fare and are refundable. START THE NEXT DECADE WITH A GREAT CRUISE! More than 50 people are already registered for this group cruise! Join the party! Senior Getaways is your PRINCESS CRUISES specialist! Can't join one of our group cruises? We can book any Princess cruise, any date. Let us help you plan your next cruise. 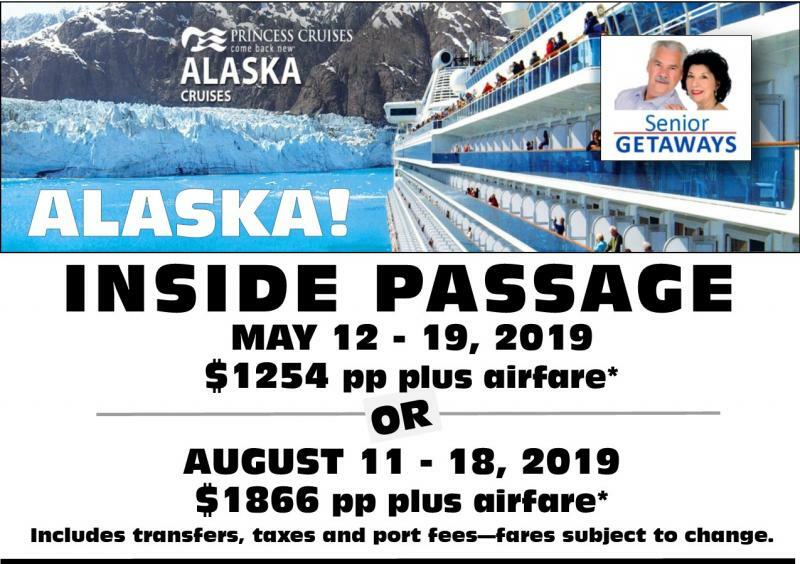 Book by February 28, 2019 to get $300 per cabin in on-board spending money, plus free specialty dining! Tarrant County Judge Glen Whitley. Our mission is to bring affordable, quality travel to the active seniors of North Texas. All trips originate in the Fort Worth-Dallas area. Don't see a destination you have been eager to experience? Let us know. We are always searching for great new destinations! or send us a message anytime! Copyright 2014 Senior Center Travel. All rights reserved.